So far this year my travels have taken me up the coast of California and parts north. Then I headed a bit east to explore the Sierra Nevada. Statistics show that the drought is affecting all parts of the state. I’d heard that the Tahoe Queen had to modify it’s path around the rim of Lake Tahoe to avoid rocks. I had to check it out for myself. Just how low could that big blue body of water be? And what affect is the water situation having on the gardeners up there? From the first glimpse of the Truckee river that is the sole outlet for Lake Tahoe I could see that the water was lower than usual. Still looked like enough water to negotiate a tube or small raft but the rafting companies have already closed for the season with the flow from the lake at only half of what it is normally in August. Hiking on the Tahoe Rim Trail next to the river was beautiful. The native plants and trees can exist even without the normal snowfall. They might not put on a lot of growth during dry years but they still looked healthy. 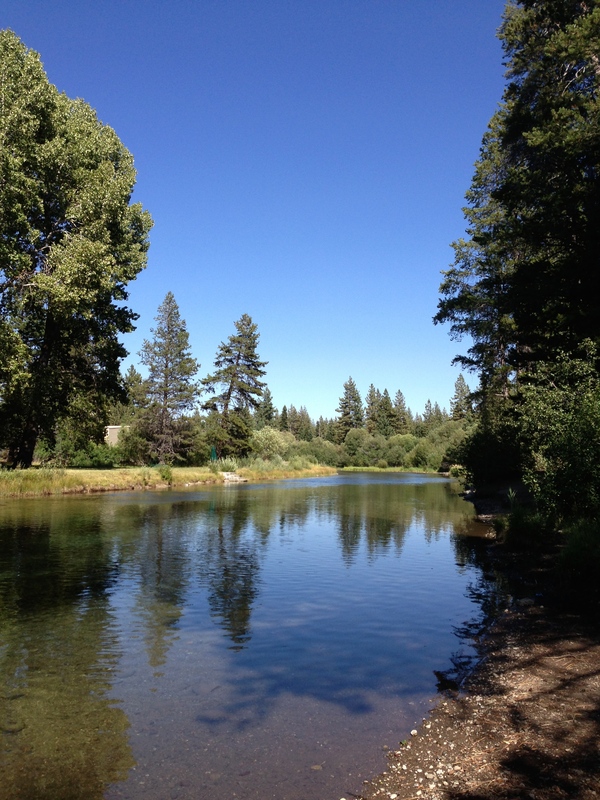 There is a chart at the dam where the Truckee river originates on the north side of Lake Tahoe. The graph shows that this is not the only drought event to have hit the Tahoe Basin. I was told the lake has been lower than this many times. Back in the 1930’s, 1962, 1976 and especially during the early 90’s the lake level dipped even lower. 2004 and 2010 were also low years. The lake level is just above the natural rim right now. The average daily evaporation rate of the lake is 397 million gallons. In Tahoe City there is a destination nursery that I always visit when I’m in the area. 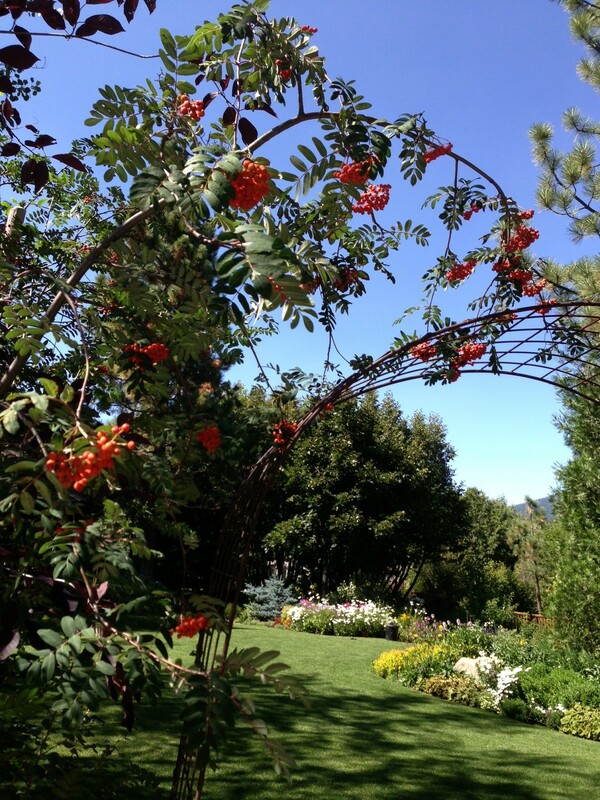 In addition to several acres of trees and plants, the Tahoe Tree Company’s grounds are beautifully landscaped. A small lawn in surrounded by perennial beds loaded with flowers and a gazebo bordered with Autumn Joy sedum was just starting to bloom. Stands of quaking aspen towered over the shade beds of hosta, begonia, astilbe and New Guinea impatiens. I asked one of the employees about how the drought has affected their customers. I noticed that many of the local residents had bright green lawns surrounded by dahlias, rudbeckia and ornamental grasses. She told me that many water companies serve the communities around the lake. They get some water from the lake itself but the rest is from springs which are drying up. The Tahoe City Public Utility District recommendation is to reduce water consumption by 20% with watering on even or odd days depending on your address. Changes this season at the nursery range from reduced sale of seeds because seeds need regular watering to get started. Also customers are requesting more native plants but I was told that some of those requested are high water usage plants like dogwoods and willows. Customers are mulching more and learning which plants are drought tolerant. Popular natives include Sierra currant, Bitter and West Sand cherry, Mountain spiraea and elderberry. Strolling the grounds of the nursery a brilliant gold plant caught my eye. Morning sun shone on a group of Sun King aralia and I had to find out more about this beautiful plant. 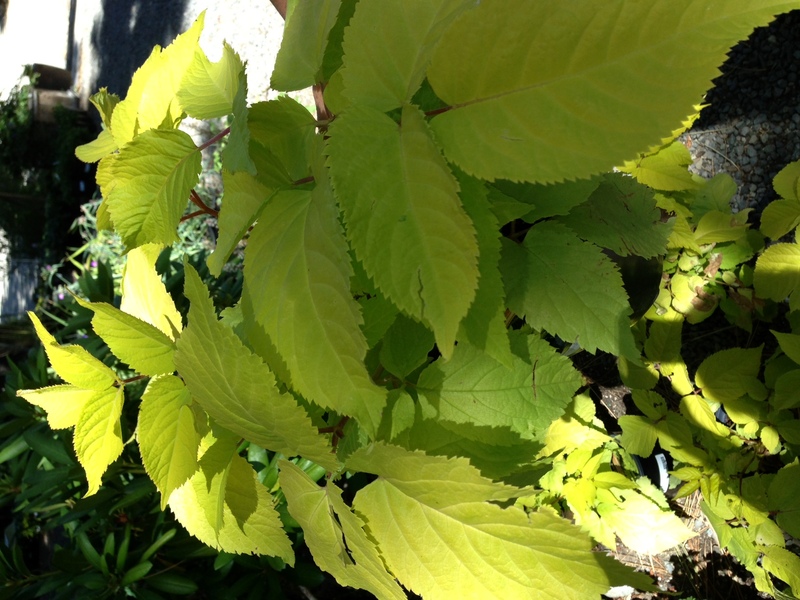 In mid-spring this fast growing, 6 foot plant emerges with bright gold leaves. In sun the foliage remains gold through out the summer. In full shade, the foliage will be chartreuse to lime green in color. Spikes of tiny white flowers emerge in summer followed by ornamental black fruit. This plant is deer resistant. It’s needs some moisture so combine it with other average water users in the same bed. We are all hoping this winter will bring us some relief from the drought, even those who live next to that big blue lake. Last fall my sister lost her favorite tree in a windstorm. She lives on Fox Island in the southern part of Puget Sound. I remember hearing about the extraordinary Pacific storm on the national news shattering records in the Northwest. Gusts up to 76 mph closed bridges, falling trees hurt 2 people and thousands lost power. Her Silk Tree didn’t stand a chance. While visiting over the Christmas holiday I thought it would be a nice present to replace her dearly departed tree. Several nice ornamental trees made the short list including the Katsura tree with leaves that smell like vanilla in the fall and Forest Pansy redbud with magenta spring flowers, burgundy heart-shaped summer leaves and reddish-orange fall color. We also considered the native Pacific dogwood but she already had one in the yard. Driving around we started to notice the beautiful color of the Coral Bark Japanese maples in many landscapes and the decision was made. I knew we would have no trouble finding a good specimen in the Pacific Northwest and I was right. 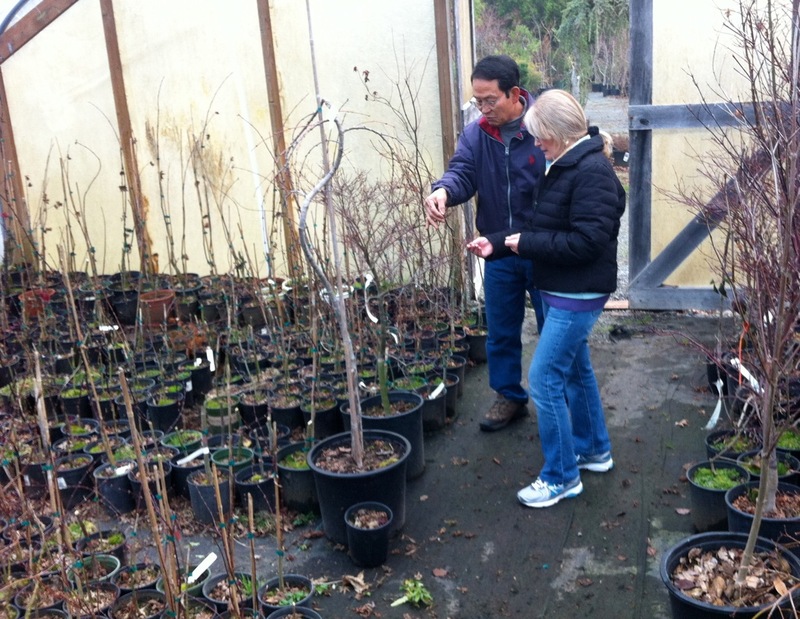 Close by in Gig Harbor we found Yang’s Nursery and I walked into the realm of a Japanese maple expert. Owner Won Yang opened the nursery to give us a tour of the grounds. We walked between rows of hundreds of maples and marveled at the huge bonsai specimens of Weeping Katsura tree, Harry Lauder’s Walking Stick, several different conifers and a very impressive, beautifully pruned Oshio Beni Japanese maple all over 20 years old. 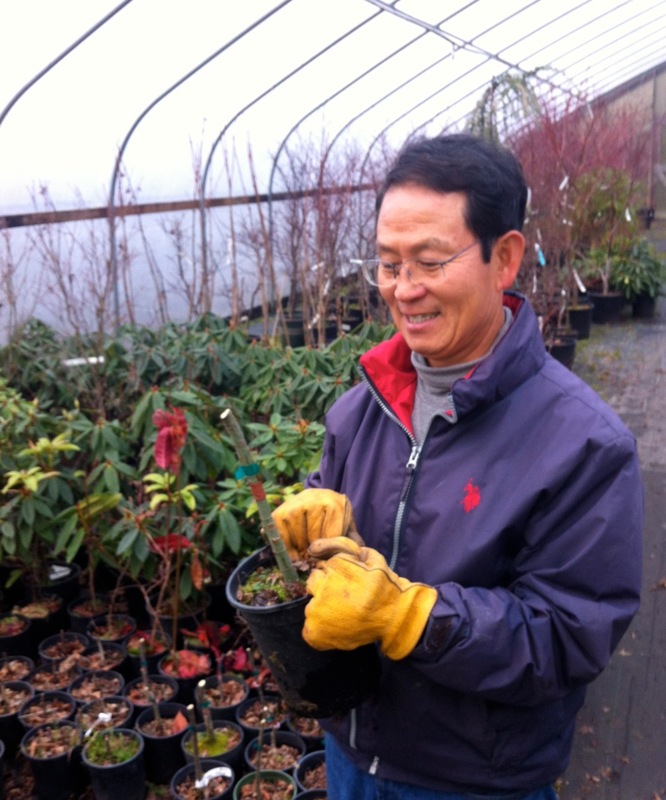 Won showed us his greenhouses where he propagates the maples himself. He has been in the business for 30 years so he knows his stuff. Starting with a small green maple seedling with a half inch stem that is cut off 6″ above the ground, he carefully grafts a tiny tip of new growth from the desired specimen onto the larger stem. It will take at least 3 years before the new tree will be big enough to sell. Won’s pride in his work was apparent as he smiled at the rows of newly grafted maples. Back out among the maples, I had my eye on the rows of coral barked Sangu Kaku maples when I saw them. Lined up alongside were several trees with bark so bright I couldn’t believe my eyes. “What are these”, I asked? Won just smiled and told me they were called Beni Kawa Japanese maples and were a cultivar originally developed in 1987. 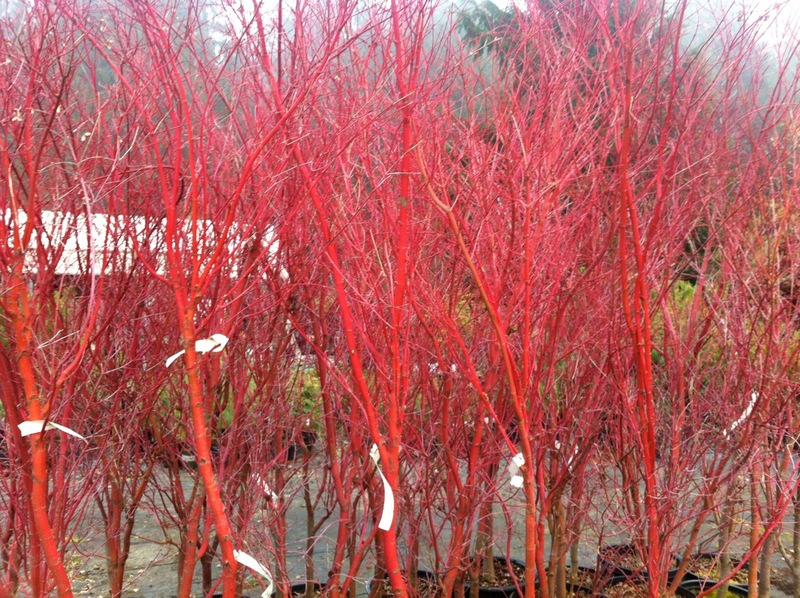 They are prized for their brilliant salmon red bark which is much brighter than the regular coral bark maple. I was hooked. How could I not plant this gorgeous tree in my sister’s yard? I learned that the bark of this tree can be polished to keep the bright color. Lichen often grows on older trees hiding the salmon red bark of the new branches. I’ll have to try using a soft cloth on my coral bark maple and see how it turns out. The Beni Kawa is a fast growing Japanese maple that will eventually reach 10-15 ft tall and 5-12 ft wide. It is hardy to 15 degrees. Won grows his trees in a 50/50 mixture of top soil blend and fine crushed bark. He fertilizes with a balanced granular fertilizer and prunes in the winter. The 6 ft tree I bought my sister will not need to be pruned for a couple of years allowing it to establish a strong root system. I’m looking forward to seeing how the new tree evolves as it grows especially since I know where this Beni Kawa Japanese maple was born. Gardeners are always on the look out for new plants. I recall when I worked at a nursery looking over the showy dahlia shipment for the one that was a deeper, more vivid shade than all the rest. One color that always gets my attention is chocolate. Whether I find it in the foliage of a plant or the flower itself it's one of my favorites. You can imagine my delight when I discovered the Chocolate Flower Farm in Langley on Whidbey Island while I was visiting the Puget Sound recently. I was a kid in the candy store. As a landscape designer I often get requests for certain colors to be included in the plant palette. Mahogany,burgundy, deep magenta, midnight blue, eggplant often make the list. Many people like dark flowers or foliage paired with ivory, others prefer peach or chartreuse. I marveled at all the combinations at the Chocolate Flower Farm. Some plants are the color of chocolate and some smell like the real thing. Chocolate cosmos looks and smells just like a dark chocolate bar. The warmth of the day releases this delicious fragrance. A favorite flower for the perennial bed it's always a winner with kids. In addition to chocolate cosmos, a wildflower called chocolate flower or berlandiera lyrata grew at the farm. I also enjoyed the fragrance of warm chocolate in the flowers of chocolate akebia, chocolate mint and chocolate snakeroot. Strolling the grassy paths at the Chocolate Flower Farm I admired a Sparkling Burgundy pineapple lily. The foliage, nearly black, glistened in the sun growing next to a white-flowering Nine Bark called Summer Wine. Nearby a clump of two-tone chocolate and ivory daylillies bloomed. With grazing horses nearby and a dozen ducks taking turns bathing in a kiddie pool the scene was idyllic. At every turn a different pairing of chocolate flowers and foliage caught my attention. One section featured plants for a kid's chocolate garden. Easy to grow chocolate pincushion flower, chocolate viola, chocolate nasturtium, chocolate snapdragon, chocolate sunflower and chocolate painted tongue would be fun for any child to have in their own garden. I loved a penstemon called Chocolate Drop as well as a Mahogany monarda the color of deepest magenta. Blooming black sweet peas grew up and and over an old bed frame. 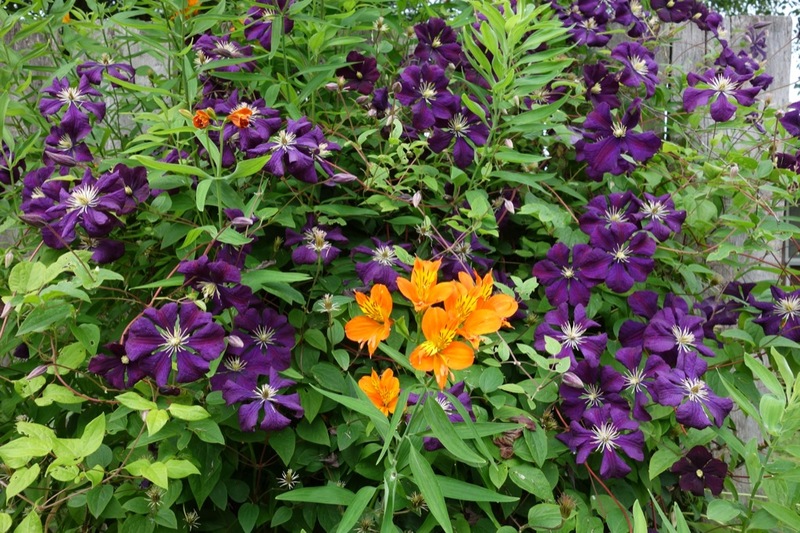 A dark purple-black clematis from Russia called Negritanka intertwined with lime green hops covering an arbor. Toffee Twist sedge, Royal Purple smokebush, Chocolate Sundae dahlia, Sweet Hot Chocolate daylily, Chocolate Plant and Hot Cocoa roses grew in many of the flower beds. What makes dark foliage or dark flowers pop? At The Chocolate Farm each bed pairs the deep rich chocolate color with another contrasting shade. I don't know which was my favorite. One area featured peach, pink and silver to offset the darker shades. Pink dahlia and fairy wand, blue oat grass and rose colored sedum 'Autumn Joy' made a lovely vignette. Another bed paired the yellow flowers of phygelius 'Moonraker' and digitalis grandiflora with white anemone and ivory dahlias set among Chocolate Baby New Zealand flax. Not to be ignored the dark chocolate shade of black sambucus growing next to a golden Himalayan Pheasant Berry made an impression. All-gold Japanese Forest grass at the base of dark leaved Tropicana canna lily was also a show stopper. 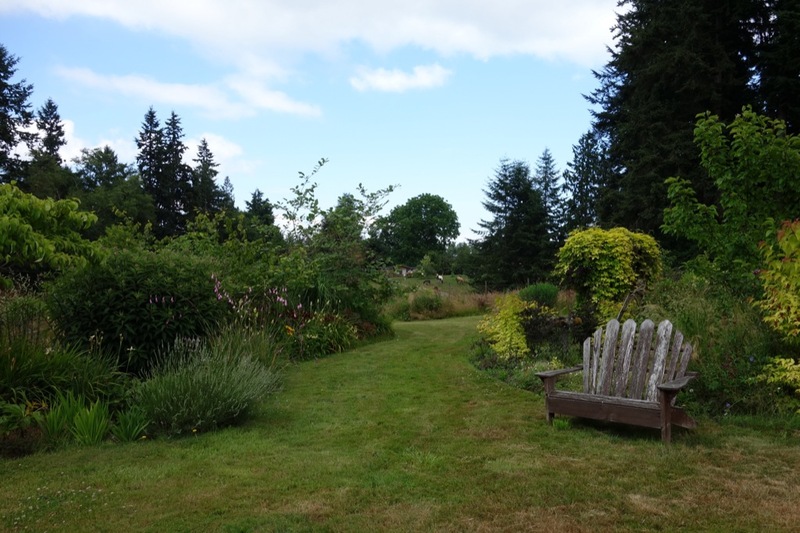 If you are up on Whidbey Island, the Chocolate Flower Farm is a great place to spend an afternoon. If your vacation plans don't include the Pacific Northwest, plant some chocolate in your own garden. My summer travel season started this year in the Puget Sound in the Pacific Northwest. My sister lives on Fox Island overlooking the sound with a breathtaking view of Mt. Rainier. There are so many gardens and nurseries in this area I hardly know where to start when I come up here. Any destination was sure to provide lush landscapes and a cornucopia of colorful flowers. green island at the southern end of Puget Sound. After the ferry docked we headed south to visit The Country Store and Gardens. 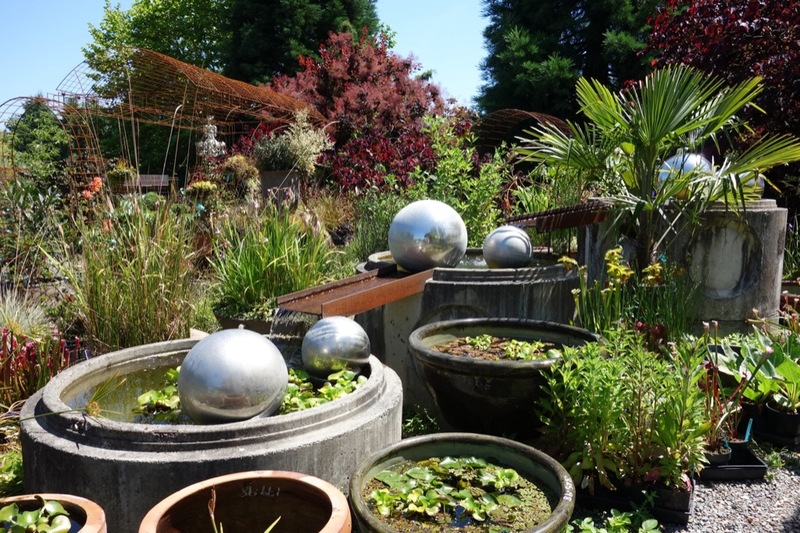 This nursery in the heart of the island boasts mature plantings on a 10 acre site with the nursery featuring rare and and unusual plants along with a wide selection of perennials, shrubs and blueberries. The flowers of a deep, dark purple clematis mingled with a rich pink, climbing cabbage rose both growing on a long trellis surrounding the front porch of the store. A dead fruit tree was left to provide support for another midnight purple clematis blooming above a bed of deep red Lucifer crocosmia. I'll remember this exciting pairing for a future design where the spreading crocosmia won't be a problem. This nursery propagates many of their plants from their own stock. 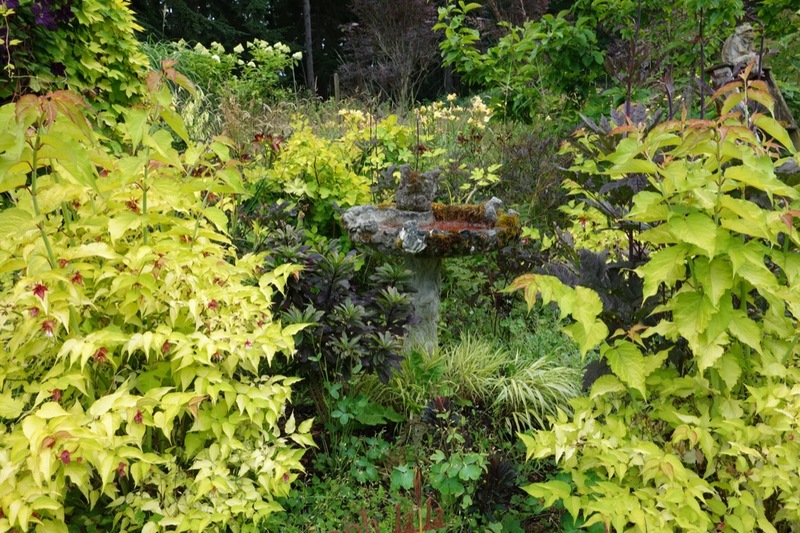 Mature specimens of ornamental grape, lace-cap hydrangeas, tangerine colored alstroemeria, hellebore and heuchera grew in the perennial beds bordered by sections of cut logs. We enjoyed the sweet scent of Summer Ice daphne and admired the velvet red blossoms of Serotina honeysuckle before moving on to our next destination. The Pacific Northwest is famous for their lavender fields. The soil and climate here really agrees with this plant. Lavender Hill Farm is just one of many lavender growing concerns on the island. On a hill overlooking the picturesque Quartermaster Harbor, several lavender varieties are grown. You can pick some for yourself or buy some already harvested. Sitting under an apple tree, a young worker introduced herself as Audrey and told me the farm grows several French lavender varieties. Grosso is grown for the long stems and fat flower buds, Provence for intense fragrance and Melissa and Coconut Ice for their pink flower buds. It's a beautiful spot with sailboats docked below in the tiny harbor. Next stop, famous in the nursery world, was Dig Nursery. I've seen it mentioned in Pacific Horticulture and Sunset magazines. The plants here are displayed in very unique ways making this destination nursery something to be experienced. Massive gabion pillars made of heavy wire fencing and river rocks provide the base for rusted ornamental iron trellises and arbors. More rusted iron is fashioned into hanging planters overflowing with flowers, succulents and grasses. Repurposed cyclone fence sections provided a perfectly drained platform for more succulents, native plants, herbs and grasses. Several pots of unique black daylilies caught our attention as did the large collection of Darlingtonia and other carnivorous plants. In the shade section, a lime-green lace cap hydrangea was offered for sale with mopheads, Japanese forest grass and hellebore. 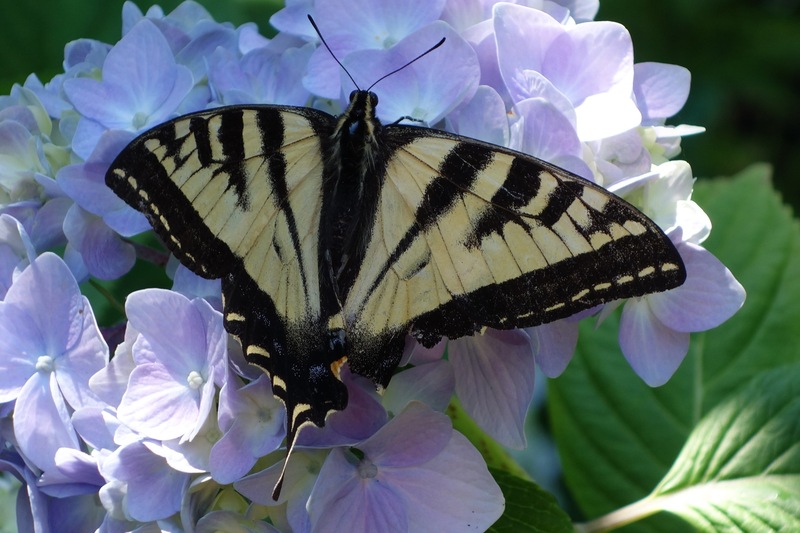 We wondered if the resting Swallowtail butterfly came with the pot of hydrangeas. Another ferry another island. This time the ferry takes us to Whidbey Island. Here there are flowers blooming everywhere. Hanging baskets of purple and lilac supertunia, lobelia and red ivy geraniums grace every light pole. The container plantings burst with color. White rugosa roses grow on a split rail fence overlooking the harbor in Langley. One of our stops on the island is Meerkerk Rhododendron Garden. At this time of year we thought the show would be over but we were pleasantly surprised to find several very specimens still blooming. There are so many kinds of rhododendrons here and we were drawn to one called Golfer with silver fuzzy leaves. Another one had velvety rusty red leaves that sparkled backlit by the late afternoon sun. 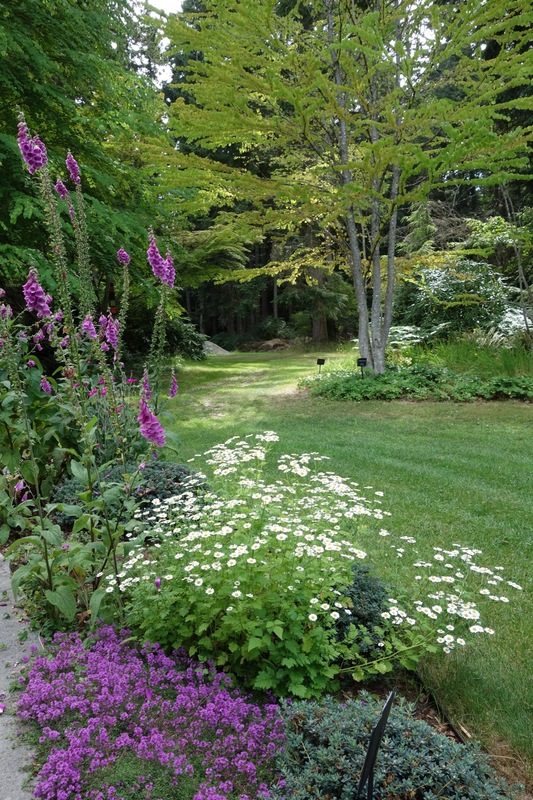 The perennial beds were filled with lilac oriental poppy, dahlia, campanula, lavender and shasta daisy. A 30 ft white dogwood shone like a beacon surrounded by the deep green fir trees. Bordering the curving paths, oregano and moss covered fieldstone beckoned one to linger and admire the smaller jewels of the garden. Another highlight of my tour of gardens was a visit to Chocolate Flower Farm in Langley. 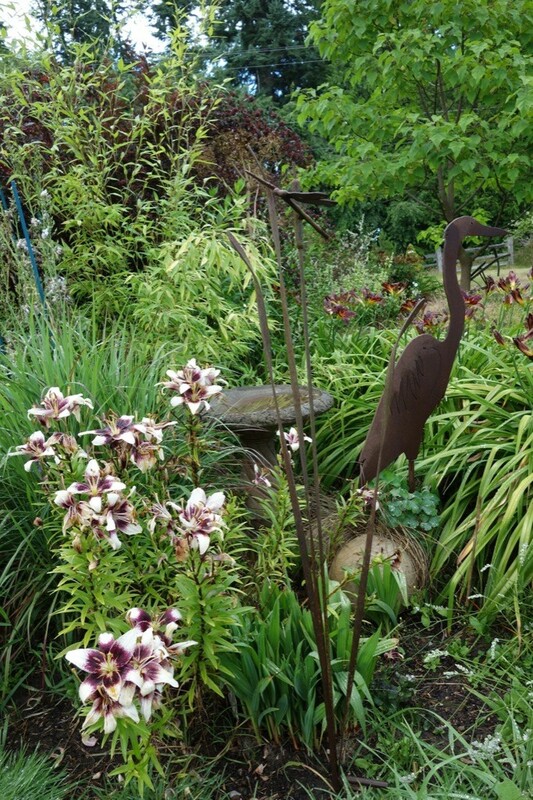 If you like deep burgundy, chocolate, black, midnight blue, deep magenta or mahogany flowers and foliage like I do you would also be amazed by this garden. There is so much to share about this special place that I plant to write about all it's treasures in another column. Stay tuned. As I left to fly back to California and the redwoods I thought that in some ways this temperate rain forest is not so different from ours. It's a little greener up here during the summer and the daylight from 5am to 10 pm makes the plants bloom like crazy, but there's no place like home.